Posts tagged with "TV shows"
An old girlfriend introduced me to Six Feet Under more than a decade ago, but it turned into such a grind that I managed to finish the series only last week. There’s a lot of complex drama without stability to balance it out, a lot more tension than resolution. One of the most common themes is characters seeking happiness in all the wrong places, just to escape the depressing reality of their lives, and usually ending up worse for it. It wasn’t easy to get through five seasons of people making terrible decisions in their relationships, and watching those decisions haunt them later. I spend my time squaring away everything in my room so that I’m comfortable enough to write. The extra cables are gone, as well as the random receipts and bus transfers that somehow end up on the carpet. My mirrors are all in place, making the room seem twice as big, but I when I look I only see myself, slouched comfortably in my chair, hood over my head. Even Dolly has wondered in to lay herself flat on the empty floor. By the time I’m done cleaning, I’m at a loss for all the things I’ve been trying to get into well structured paragraphs. A new episode of Trailer Park Boys is playing on Showcase, and I’m watching it with the sound off because too much information would ruin the fourth season, something I’m determined to see in order from the beginning. Ricky’s in a high school, completely out of place as a thirty-something man in shop class trying to make some hash or grow some weed or harvest some kind of narcotic, and this only adds to my amusement. 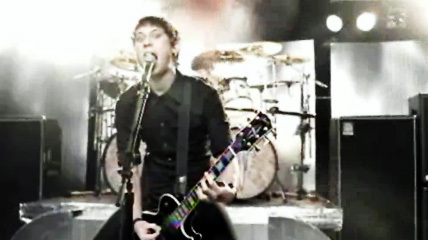 I’ve been letting my hair grow out, à la Matt Heafy in the video for Pull Harder On The Strings Of Your Martyr. Somehow, I’ve only now discovered that my hair naturally grows towards the front, and by brushing it forward, it still looks respectable when I haven’t had it cut in a month and a half. I’ve been in an odd mood lately. Thoughts branch off in my mind, but nothing seems solid enough to follow through. Inspiration always comes the day after today.